Petero Uluilakeba walked four kilometres from his home just to just get to the polling venue on time. 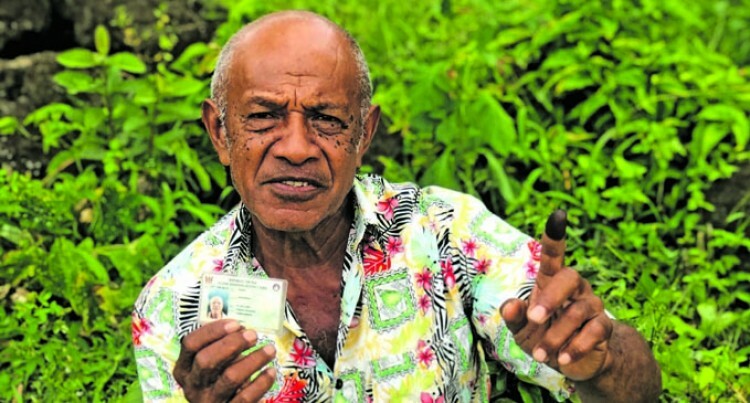 The 70-year-old of Bouma walked to Vitogo Village in Taveuni to cast his vote on Wednesday. “This is something, I have been looking forward to since the beginning of the year- I am proud to cast my vote and be one of the many Fijians whose voice will be heard,” the former post master said. “This year the competition is stronger than the previous years. “We are more informed because we get to listen to what the party leaders have to say through the radio. “I voted for the FijiFirst Party because of all the developments they have done in my village and province. “This Government walks the talk unlike previous Government. “When Sitiveni Rabuka came to Taveuni he made promises to us, but did nothing- so why should we vote for him?” he said. “I voted for the FijiFirst Party because I can see prosperity in their manifesto, I believe so much in the Bainimarama Government. The voting was held in the middle of the village and the time of voting was from 3pm to 5pm with more than forty Fijians participating.